1) I’m still here. Obviously, a birthday just means that you are older. Growing up with a mom who has always suffered with serious health issues, I saw her embrace and be proud of her birthday every year because, Hey! She’s still here! She’s made it! When I was a kid my dad also had health issues while suffering with cancer and he made it too! Then there’s my health issues that almost killed me as a teenager and I fought through that to be here today. I cannot deny that growing up surrounded by health issues and positive attitude towards getting older has had an effect on me. 2) I get to be around and thank my loved ones. 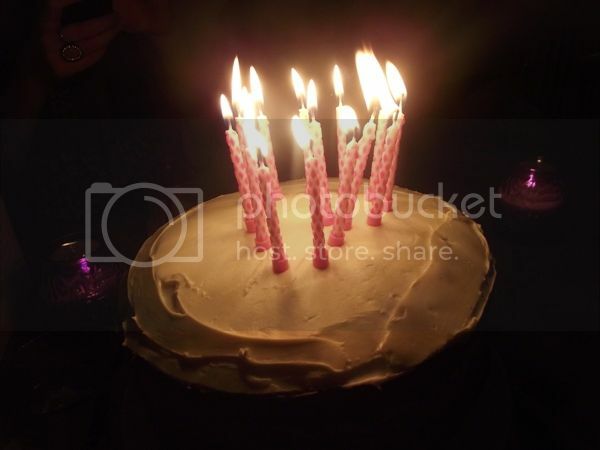 The birthday is the epitome of selfishness – I get the gifts, I blow out the candles, etc….but I really like spending birthdays with my husband, close friends and if possible, family and also making the day about them. They enhance my life and a birthday is a celebration of life, so it all makes sense to me. 3) I’m more comfortable with myself. It’s true that as you get older, you are more confidient and you stop caring what others think. 4) I get to have a birthday! In some parts of the world, people don’t acknowledge their birthdays because it’s a luxury. They are more focused on surviving than anything else. It’s a privilege to have a birthday. 5) I’ll be the age that’s the title of one of my favourite Smashing Pumpkins songs! OK, that’s a little thing, but it’s still a perk. This entry was posted in Uncategorized by Christina. Bookmark the permalink. Happy Birthday! Great attitude. I like your thinking. And, I can relate on number one. Enjoy the day. Thanks Darla. I figure you can definitely relate to #1! Happy Birthday to you too!! Nice cake! Point 3 makes me think of the TS Elliot poem: The Love Song of J. Alfred Prufrock . Wasn’t very relevant when I was 12…how a couple of decades changed that! I like being an age featured in my favourite songs too, the best was when I was 22 like in the Suede song Trash and my party event on facebook was called “Cracked up, stacked up, 22” like the lyric. But it’s gone a bit downhill since then, maybe you can help me with a 27 lyric? I’m looking forward to your birthday too 😀 It’s sad when people moan about their birthdays since we get older every single day, so we shouldn’t moan about the one day when we can celebrate it and have fun! I don’t know that poem, but am going to look it up!